Trying to make the most of what's left of the Summer weather in a classic shorts and t-shirt ensemble. 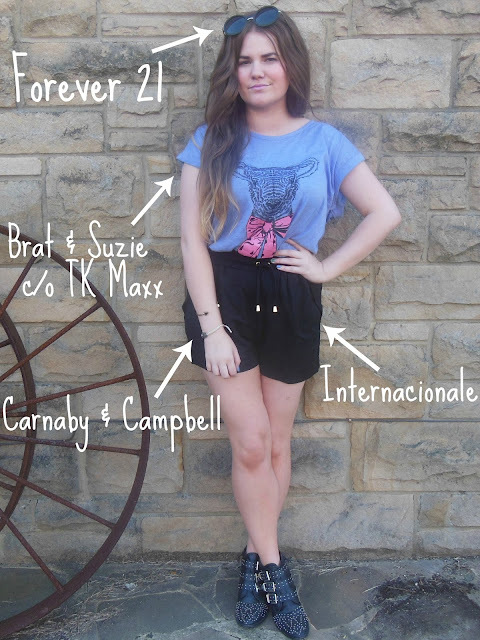 I love this cute little tee from Brat and Suzie, and couldn't believe that I got it for a bargain price in TK Maxx. I really love the colour, blues and purples are always my favourites and the cute lamb design gets a thumbs up from me... I want a puppy design one next! I'm quite a girly dresser, so it's nice to wear something that little bit more casual for a change... this is the first time I've worn it quite dressed down. I usually style it with a blazer, skinny jeans and boots, which works really well too, but it was a bit too warm for that! The shorts are the perfect day to night style, easy to dress up or down. Their only downfall is that they always seem to look quite creased, they're that soft material that crinkles the minute you sit down! I can't stop wearing them though, they go with everything.